The Camino Ingles is one of several modern pilgrim routes to the Cathedral of St James in Santiago de Compostela in Galicia. It’s the shortest route to Santiago, 75-120kms depending on whether you start from the ports of Corunna or Ferrol. I walked the longer route from Ferrol in 2011 and at the time I gave little thought to its history. Subsequently I have been prompted to seek answers to several questions about this route and its medieval origins. But first let me describe my journey on the Ingles to Santiago. In the spring of 2011 I walked the Via de la Plata from Seville to Santiago with an Australian friend. He had a couple of weeks before he had to fly home so we walked on to Finisterre and then took a bus to Ferrol and walked the Camino Ingles back to Santiago. The sky was grey and unpromising as we joined a few other passengers on the early morning bus to Corunna. While we waited for the connection to Ferrol a middle aged woman came up to me, “Vas a Santiago?”, “Si” I replied and she asked me to fill in the numbers on her Lotto card! I wonder if I was lucky for her? By the time we reached Ferrol the sun was shining in a clear blue sky, so at least we had been lucky. We picked up a map at the Tourist Office showing the route of the Camino out of the city and got a stamp on our Credencial. The Camino starts beside the waters of the harbour and so did we. Entering and exiting cities on any Camino can be challenging, the traditional Camino waymarks are easily missed, but we had no problems leaving Ferrol and were soon following the path beside the estuary on the way to Narón. Our plan was half a day to Neda and then four longish days to Santiago. We had already walked 1,000kms from Seville so were fit enough. Only 12kms to Neda but it felt longer as the route twisted and turned following the shoreline all the way to the head of the Rias and the pedestrian bridge across the Xubia River. The albergue was a modern building, clean and comfortable. A friendly Hospitalero and a few other perigrinos from France, Canada, Spain and Germany. For the next four days we had fine weather as we headed south to Pontedueme, Mino and Betanzos and then inland to Bruma to merge with the route from Corunna and on to Santiago. Leaving Neda on a long day to Betanzos, we were soon walking on woodland trails before emerging onto the Praia da Madalena on the Eume estuary. It looked very inviting in the bright morning sunshine and we stopped for coffee before moving on across the 14th century bridge, up through Pontedueme and out into the countryside beyond. Presumably the medieval route lies beneath the modern roads, but the Camino runs parallel sometimes one side sometimes the other, on woodland trails and small country roads with very little traffic. It also makes unexpected detours up and downhill away from these roads for no obvious reason. Eventually the route makes a steep descent and crosses the bridge into Betanzos. The next day we climbed up out of Betanzos and followed the route south through oak, pine and eucalyptus woods along quiet country roads through little villages where old men and women were busy working in their vegetable plots. As we approached Bruma the Hospitalero passed us on his bicycle on the way to open up! Another modern, comfortable albergue and some of the same faces from Neda. After Bruma it was easy walking on country roads and through a succession of little villages. Occasionally sunken lanes through lichen covered oak woods, dark and cool and easy on the feet. Occasionally gravel roads through pine woods. At the hostal in Sigueiro, a busy little town, we had dinner with two Irish women of advanced years, veteran perigrinas, who had walked from Corunna. They were great company. On the final day into Santiago the route ran parallel with the main road taking detours off into the woods every so often. For anyone interested in walking the Camino Ingles there are several published Guidebooks. How popular is the Ingles? The Camino Ingles is one of seven principal routes for which the authorities in Santiago (Oficina del Peregrino) collect and publish statistics. These routes are the Frances, Portugues, Norte, Primitivo, Ingles, the Via de la Plata and the Invierno. The total number of peregrinos making the journey to Santiago has steadily increased over the last thirty years, and more rapidly in the last decade. The Frances, with its deep history, has always been the most popular route, chosen by 80% of peregrinos in 2007. But as numbers have increased the Frances has fallen to 60% in 2017 and other routes have become more popular with first time peregrinos and those returning to Santiago for a second or third or more times. The trend can be seen in the numbers extracted from the official statistics (figures in bold are for Jubilee Years).. Although pilgrim numbers on the Ingles have increased in recent years and it is now more popular than the La Plata, in 2017 it was still the third least travelled of the Caminos. There could be a couple of reasons for this. It’s short, only a three or four day hike, which might appeal to those with little time to spare, but it doesn’t provide the long immersion in the pilgrim community of the Frances or the Norte or the La Plata. For those making their first Camino, it may fall below the radar of the published guidebooks and travelogues of the longer routes. Hard to imagine the name would put people off, but perhaps! What do we know about the history of the English Way? If you visit the website of the Xunta de Galicia, there is a page about the English Way, which claims that medieval pilgrims from Northern Europe ‘reached the north of Spain by ship, entering Galicia via the ports of Ribadeo, Viveiro, Ferrol or A Coruna. Although it provides no references, it also claims that the existence of these pilgrims is confirmed by the origin of those who died recorded in the archives of the chapels and cemeteries of the monasteries and hospitals along the way. Maritime pilgrimage from Scandinavia and the British Isles began in the 12th century with one of the most noteworthy episodes occurring in 1147 with the ‘arrival of a squadron of crusaders on their way to the Holy Land’, and ‘during the Hundred Years War that raged between France and England throughout practically the whole of the 14th century and the first third of the 15th century’, British pilgrims were obliged to sail to Santiago. The vessels carrying these pilgrims sailed from ‘London, Bristol, Southampton, and Plymouth and would return to England loaded with goods from Galicia’. The presence of these pilgrims in Santiago is ‘well-documented by the ceramic pieces and coins dating from 14th and 15th centuries, found during excavations in the cathedral’’. Once ashore, pilgrims on the English Way found refuge in the hospitals ‘provided by the religious order of the Sancti Spiritus’. There were pilgrim hospitals run by the ‘Hospitalers of the Sancti Spiritus located in Ferrol, Neda, Miño, Paderne and Betanzos’. There was also pilgrim’s accommodation ‘run by the religious orders of los Ángeles, Santa Catalina and San Andrés’ along the route from Corunna. Many of the hospitals along the Way ‘had chapels and cemeteries, whose archives contain records of the deaths of pilgrims of English, Nordic, German, French and Italian origin’ . The 12th century Codex Calixtinus is a contemporary medieval account of the Way of St James which includes a description of the itinerary of the land route from France. In the 15th century there are a few contemporary accounts from pilgrims who made the journey by sea to Galicia and Santiago. William Wey (Davey 2000) a fellow of Exeter College, Oxford and Eton College, made the journey in 1456. In his account he says that he sailed from Plymouth on 17th May in a fleet of six pilgrim ships arriving in La Corunna on 21st May. From there he made his way to ‘St James in Compostela on the Eve of the Feast of the Holy Trinity’. He returned to La Corunna and sailed for England on 5th June arriving in Plymouth on 9th June. Whilst at La Corunna he recorded that in the port there were ’80 ships with topcastles and four without. They included English, Welsh, Irish, Norman, French, Bretons and others. The total of English vessels was 32’. William Wey subsequently made a pilgrimage to Rome and Jerusalem in 1458 and again to Jerusalem in 1462. Margery Kempe an early 15th century English Christian mystic made pilgrimages to Jerusalem and Rome, and in 1417 to Santiago, sailing from and returning to, Bristol. She makes little mention of the crossing, only recording she had fair wind and weather, and a passage of seven days. Robert Langton (Tate 1995) who was born in 1470 made a pilgrimage to Santiago some time before 1522. He seems to have taken the land route along the coast of northern Spain (presumably the modern Camino del Norte) passing through Oviedo and Ribadeo. He joined the English Way at Betanzos, and visited La Corunna and the Hospital at Bruma on his way to Santiago. There are numerous scholarly works on medieval pilgrimage to the Holy Land and Rome, and Santiago along the land routes through France and northern Spain. But I wanted to know more about the sea routes, so I went in search of published historical works. The Confraternity of St James is a UK-based charity established to promote pilgrimage to the shrine of St James in Santiago de Compostela. It has published two books on the history of the English Way. Constance Storrs’ (Storrs 1998) excellent study of pilgrimage from England based on official English and Spanish records from the 12th to the late 15th century, and Robert Tate’s (Tate 2003) short pamphlet on pilgrimage from the British Isles in the Middle Ages. The number of licences granted each year was generally less than 10 and, for whatever reason, licences were not granted every year. Political considerations and conflict with France and Castille may have dictated how rigourously the Crown enforced and policed the licence system. There were 28 licences granted in 1395, 67 in 1428, 63 in 1434 and 33 in 1445, the latter three all jubilee years. According to Storrs licences were not necessarily for only one voyage. Presumably the size of vessels varied because the licences permit the transport of between 20 and 300, but 60 is the most common figure. The licences were granted for vessels from ports and harbours large and small around the coast of England from the south west to the north east as far north as Newcastle. However most pilgrims took ship from ports in Cornwall and Devon and from Bristol. Of course the licences tell us nothing about the origin of the pilgrims but presumably they travelled from all parts of the kingdom. Only one licence was granted to a ship from a Welsh port, Philip Morgan the owner of the Trinity of Newport who was licenced to take 300 pilgrims in 1462. Welsh pilgrims may have travelled to Bristol or crossed the Bristol Channel and made their way across the peninsula to ports on the south coast of Cornwall and Devon, but more of that later. Storrs makes no attempt to estimate the number of pilgrims making the voyage to Santiago, but I will. If we look at 1428 for example, 67 licences were granted. The number of pilgrims permitted to travel by these licences adds up to just over 3,000. If we assume each vessel made three return voyages during the season then the total number of pilgrims following the English Way to Santiago in that year would have been 9,000. Of course three voyages may be too many as an average, on the other hand masters may have carried more pilgrims than permitted by their licences. It’s a working estimate and nearly twice the number of modern perigrinos from the UK who received their Compostela from all routes in 2015. Tate’s short pamphlet covers the historical reasons for pilgrimage, the medieval context, the sea routes used by pilgrims as well as the vessels in which they travelled and a little about their experiences and finally he comments on the remaining artefacts and documentary references that give testimony to the journeys made by medieval pilgrims to Compostela. He acknowledges the valuable work done by Storrs. An interesting illustration is a map of the western seaboard showing the sea routes to Spain used by pilgrims from the British Isles. As well as all the ports listed by Storrs, the map includes ports around the southern coasts of Ireland, Galway, Dingle, Kinsale, Waterford, Wexford and Dublin. The map also suggests that Irish pilgrims sailed to Wales and Cornwall before embarking again for Spain. As we shall see later, all these routes to Spain were initially trade routes before owners and masters saw the commercial value of including pilgrims in their cargoes. Wendy Childs (1999) gives another good account of maritime pilgrimage which makes use of much the same official records as the Storrs research as well as customs records from English ports. In respect of Irish pilgrims Childs refers to an article by Roger Stalley on Irish maritime pilgrimage of which more later. She also refers to a voyage in 1473 ‘when the Irish pilgrims aboard the Mary of London were charged 7s 6d,’ (presumably return) one assumes the English pilgrims were changed the same amount, but who knows. Interestingly there was no licence recorded by Storrs for this vessel in 1473. Finally Childs acknowledges the maritime trading links between England, Ireland and northern Spain. She refers to the written sailing directions from the 14th and 15th centuries across the Bay of Biscay which ‘provide directions from Cape Ortegal (the main landfall for Corunna) to Poitou, Britanny and Cape Clear in Ireland and from Cape Finisterre to Gascony, Brittany, the Scilly Isles and Cape Clear and Mizen Head in Ireland’. Following up on the theme of trading links along the western seaboard, books by O’ Neill (1987), Bowen (1987) and Carus-Wilson (1967) provide more information. Bowen says that Galicia had a ‘very long tradition of contact with the sea’. The Galician coast ‘constitutes one of the best examples in W. Europe of a ‘ria’ coastline formed by the submergence of the lower portion of valley-ways giving broad inlets of sheltered water’, that had been ‘sheltered anchorages for storm tossed ships from remotest antiquity’. O’ Neill tells us that there was demand in medieval England and Ireland for ‘salt along with wines from Lisbon and Cadiz and iron from the Cantabrian mountains’. While ‘Robert Russell got a safe conduct to bring wines, large salt and other merchandise’ from Spain as early as 1315, ‘the full development of the Spanish-Irish trade took place after the mid-15th century’. English merchants also brought cargoes from Spain to Ireland, but Neill says that the pattern of trade is best exemplified by the voyage of the Julian of Bristol in 1453. This ship ‘carried English products to Spain, then proceeded directly to Galway and Sligo with wine , salt and honey, and returned to Bristol with hides and other Irish produce’. The long established trade links with Spain made it natural for pilgrims to make the sea voyage to Santiago. Bowen says that Ireland ‘sent many, and references to arrangements for their departure are abundant’ although he doesn’t give any examples. He does say ‘almost every port saw pilgrims leaving for Santiago’ particularly Galway, Wexford, Kinsale and Waterford. . According to Carus-Wilson, Galway was at the ‘centre of the Irish pilgrim traffic to Compostela’. O’Neill argues that because they are on ‘a direct sailing route with the Iberian ports’ much of the wine from Spain and Portugal came in through ports on the west coast of Ireland, and that the ‘oft-quoted connection between Galway and Spain must have begun in the 15th century’. We have already noted in the contemporary account of William Wey there were both Welsh and Irish ships in the harbour at Corunna. Bowen says that some Irish pilgrims may have sailed to Bordeaux and ‘completed the journey, as was the custom, overland’. He goes on to say that others ‘are known to have crossed over south west Wales and used the trans-peninsular route from north Pembrokeshire to Camarthen Bay and then re-embarked for Cornwall’. According to Bowen records exist of ‘Irish and Welsh pilgrims using the trans-peninsula route across Cornwall from Harlyn Bay( Camel estuary) to St Austell Bay and from the mouth of the River Fowey (or St Ives Bay) to St Micheal’s Mount’. In 2004 St Michael’s Way was designated a European Cultural Route, reflecting its historical significance in the network of pilgrim paths leading to Santiago This 12.5 mile hiking route runs across the Cornish peninsular from Lelant near St Ives to St Micheal’s Mount. John Fowley, mayor of Drogheda (1472). The Mayor and bailiffs of Waterford were granted royal approval for a communal expedition to Santiago in 1472. The Annals of Ulster record the death in 1480 of Tomas MagUidir who twice made the journey to Santiago. In her History Ireland article, Rian-Raedel refers to the foundation of pilgrim’s hostels in ports such as Dublin as early as 1216 and Drogheda where ‘St James’ Street and St James’ Gate evoke the original dedication’. She argues that they ‘most probably existed in other harbour towns, such as those in the South and West, accustomed to trade relations with France and Spain’, and she adds Ardmore to the list of Irish ports. Whilst researching this post I read Katherine Lack’s The Cockleshell Pilgrim (2003). In 1986 the remains of a man assumed to be a pilgrim, complete with boots, a stout staff and a cockleshell, were unexpectedly uncovered in excavations at Worcester Cathedral. Lack identified the man as Roger Sutton, a wealthy dyer, and her book evokes his journey to Santiago in the first half of the 15th century. According to Lack’s research, Sutton made the journey from Worcester to Southampton and then to Normandy and onwards by the overland route to Santiago. She doesn’t consider the possibility that Sutton may have taken ship to Corunna, or that he may have returned to England by the sea route. The cockleshell was a key piece of evidence identifying the remains as those of a pilgrim to Santiago. Stalley says that pilgrims to Compostela brought back a momento of their journey, as most modern peregrinos do today. As well as natural scallop shells lead substitutes were manufactured on a large scale in the 15th and 16th centuries. According to Stalley the shell was more than just a souvenir, it was ‘public affirmation of the journey, a devotional object and protection for the rest of a pilgrim’s life’. They were ascribed therapeutic powers and ‘were immersed in water or wine and administered to the sick as a medicine’. Having read Lack’s book I was prompted to look for other archaeological evidence of pilgrimage. All the examples I found came from Ireland. An article by Miriam Clyne (1990) in Archaeology Ireland, reports on an excavation at St Mary’s Cathedral, Tuam Co. Galway in 1986 which uncovered two skeletons buried with one complete, and the remains of another, scallop shell. As well as the Tuam excavation, Rian-Raedel refers to further excavations that have uncovered likely pilgrim burials. 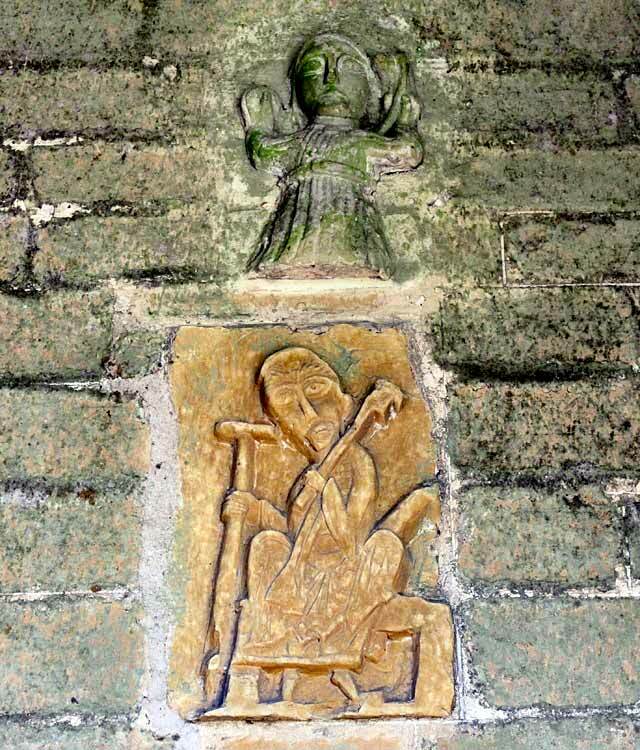 In 1992 excavation beneath the wall of a late medieval tomb at Ardfert Cathedral, Co Kerry revealed a pewter scallop shell on which a little bronze-gilded figure of St James had been mounted. In 1996 excavations at Mullingar, Co Westmeath on the site of the 13th century Augustinian priory of St Mary uncovered more than thirty burials, two of which contained scallop shells. Finally in 1998 another shell-associated burial was uncovered during excavations of the Augustinian friary in Galway. and tombs at Kilconnell Co Galway, St John’s Co Kilkenny and Kilcooly Abbey Co Tipperary. He includes the Rice Monument in Waterford Cathedral which has figures of the apostles including St James around its sides. James Rice was Mayor of Waterford eleven times in the 15th century and twice walked the Camino to Santiago. His tomb became a starting point for Waterford pilgrims as they embarked upon their journey to Compostela. Camino Ingles or Camino Irlandes? Based on all the evidence, it would be reasonable to conclude that the majority of medieval pilgrims following the maritime routes to Santiago from the British Isles were from England, and on the basis of population, a smaller number from Scotland and Wales. It is also reasonable to conclude that significant numbers of Irish pilgrims followed the ‘English Way’, either directly to northern Spain or via English ports. Whilst it might be reasonable to call the modern route the Camino Ingles, it is a pity that this name doesn’t reflect the journeys made by thousands of Irish pilgrims in the 14th and 15th centuries.